With the new session of college about to hit your daily routine with its NOT-SO-EASY life, mark your calendar for some shopping as its time to flaunt your inner fashion goddess. Trust me, initial days are the only time when you are super excited and less piled with work and assignments, it’s’the best days to let the style diva in you fly free and create benchmarks for other’s college lookbooks. Here are some clothing ideas inspired by celebrities who have their style game on point with pieces that are easily available in the market. White is the only color that can never go out of fashion, no matter what season it may be and so, the white pants. Here, Jenner has paired it with a body-hugging, crop-tank top and white shoes which give it a classy look. This outfit is totally meant for you, no matter what body shape you are. As the fashion world revives one of the best, yet long lost trend, THE BOOTLEG JEANS, it has become a must-have wardrobe essential. Since the day it kicked in, almost every other celebrity is rocking it in different ways. 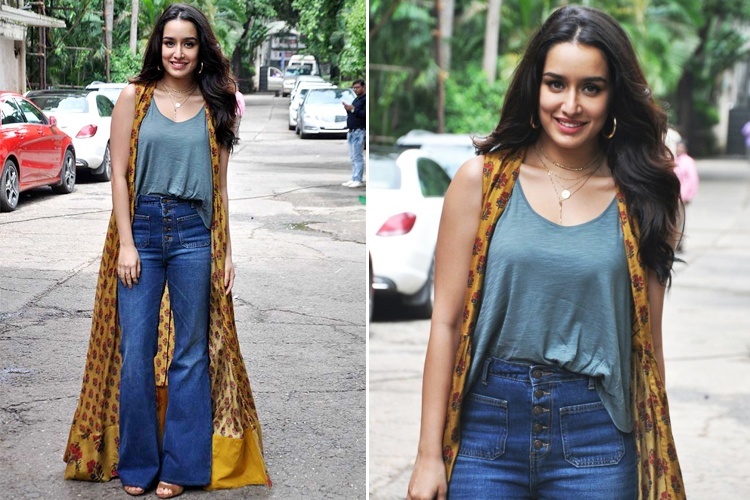 But Shraddha Kapoor's High waist jeans with a tank top stands out among others because of this totally amazing long shrug which so beautifully blends with the decent colored jeans and top. Also, her elegant accessories are a cherry on to the top for her attire. This is one of those outfits you should absolutely experiment with if you want to give of the bohemian vibe. Leather is that one item which every girl has a reserved space for both in her wardrobe and her heart. Gigi Hadid's outfit in this picture is a pure example of how leather can outshine every other fabric. This skirt definitely tops the list of clothes which are still needed to be added in one's wardrobe, along with the honey-colored polo and those accessories.